It takes seconds for the fonts to be installed in windows Vista or XP. 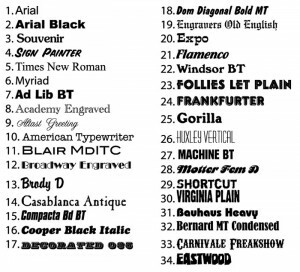 You can also get cool fonts over the internet. You can download them very easily. Once they are downloaded, then you need to install it. Follow the steps mentioned below to install downloaded fonts. Open a folder where you want to install the fonts. By double clicking on each and every font individually, it will be installed. Copy the fonts by pressing CTRL+C. Go to My Computer, then go to the drive where operating system is installed, then open WINDOWS folder then open Fonts folder and press CTRL+V to pate the fonts. This is one easy way to install all new fonts on your computer’s running on Windows Vista or XP.